Kenton started 10th (dead last) in the second heat race. He was able to finish 4th! That put him 6th in passing points. The top 16 went to the A. He started 6th in the A and finished 4th. The car was good, just not much passing. J.C. Morton won the Out-Pace USRA Modified "A" feature. 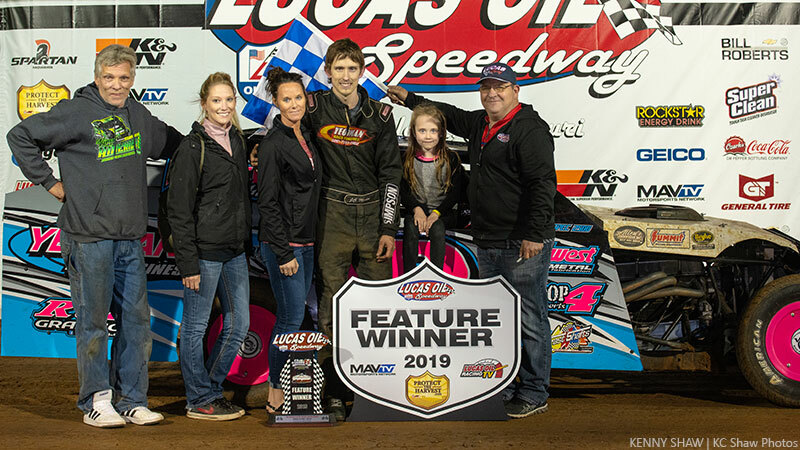 There were some familiar faces leading the way as Lucas Oil Speedway opened the 2019 season on Saturday night with J.C. Morton of Springfield (Out-Pace USRA B Mods) and Jon Sheets of Nevada (USRA Modifieds) collecting the wins. A total of 115 cars checked into the pits for opening night. Morton opened defense of his track championship with a resounding victory. He took the lead on lap 7 and quickly opened a comfortable margin over runner-up Cole Campbell of Mexico as the race remained caution-free the rest of the way. Morton said he had some doubts about making the show Saturday morning, with some motor problems, but thanked Yeoman Race Engines for getting him fixed up. Campbell started on the inside of row two and led the first seven laps before Morton got around him with an outside pass coming out of turn 4 to complete lap 8. "There early, the track was still pretty greasy from where they (reworked it during intermission) but it seemed like it helped it," Morton said. "Once I got up there and got to a clear track, I was cruising from there." Morton checked out from there and finished about a straight-away ahead of Campbell and third-place Robbe Ewing. Kenton Allen finished fourth with reigning Out-Pace USRA B-Mod National Champion Kris Jackson, who started 15th, rallying to fifth. Sheets started on the pole and led all 20 laps, beating defending track champ Darron Fuqua to take the USRA Modified feature. In a race with only one caution, which came on lap 2, Sheets emerged from an early battle with Terry Schultz to open the lead. He weaved through lapped traffic over the final half of the event to hold off Fuqua. "This is the third night we've run this year and we've had a pretty good car. I knew we would get one," Sheets said. Fuqua, the defending track and USRA Modified National Champion, was second with Schultz finishing third and Tanner Mullens fourth. The Lucas Oil MLRA Dirt Late Models open their 2019 season next Friday and Saturday at Lucas Oil Speedway for the 6th annual MLRA Spring Nationals Presented by RacingJunk.com. Full programs capped by A-features are scheduled both nights. The USRA Modifieds and O'Reilly Auto Parts Street Stocks also will be in action both nights. 1. (2) 18M J.C. Morton, Springfield, Mo. 2. (1) 1B Bobby Williams, Hermitage, Mo. 3. (4) 18 Austin Joplin, Willard, Mo. 4. (5) 112 Justin Comer, Joplin, Mo. 5. (7) 5 Jeremy Lile, Higginsville, Mo. 6. (9) 68 Ricky Watkins, Brookline, Mo. 7. (10) 19 Jimmy Cummins, Highland, Ill.
8. (6) 46 Brice Gotschall, Nevada, Mo. 9. (3) 21F Hannah Frazee, Pleasant Hill, Mo. 10. (8) 21 Gregory Scheffler, Pittsburg, Mo. 1. (1) 00T Taylor Moore, Bois D'Arc, Mo. 3. (5) 2B Bowers Michael, Rogersville, Mo. 4. (10) 98K Kenton Allen, Chanute, Kan.
5. (2) 30R Rex Harris, Macks Creek, Mo. 6. (6) 17 Rod Cordon, Independence, Mo. 7. (9) 121 Tim Phillips, Fort Scott, Kan.
8. (4) 42J Donnie Jackson, Lebanon, Mo. 9. (8) 5 John Briggs, Bull Shoals, Ark. 10. (7) 57J John Fellers, Flemington, Mo. 1. (1) 18D Curt Drake, Moran, Kan.
2. (6) 32 Robbe Ewing, Stockton, Mo. 3. (4) 1F Mitchell Franklin, Camdenton, Mo. 4. (9) 8M Dillon McCowan, Urbana, Mo. 5. (7) 10T Tyler Brown, Richland, Mo. 6. (8) 30 Mark Long, Willard, Mo. 7. (2) 14T Quentin Taylor, Wheatland, Mo. 8. (5) 64M Shawn Hendren, Nevada, Mo. 10. (3) 8 Robert King, Nevada, Mo. 1. (2) 22C Cole Campbell, Mexico, Mo. 2. (3) 28 Andy Bryant, Fort Scott, Kan.
3. (5) 22 Brian McGowen, Pittsburg, Kan.
4. (6) 65 Kris Jackson, Lebanon, Mo. 5. (1) 10P Dayton Pursley, Hermitage, Mo. 6. (8) 28A Justin Amick, Oscela, Mo. 7. (10) 10W Jason Wescoat, Wichita, Kan.
8. (7) 87 Justin Pike, El Dorado Springs, Mo. 9. (9) 6 Trenton Butler, Raymore, Mo. 10. (4) 29 Dalton Keith, Williston, N.D.
1. (1) 5 Jeremy Lile, Higginsville, Mo. 2. (3) 30R Rex Harris, Macks Creek, Mo. 3. (5) 17 Rod Cordon, Independence, Mo. 4. (2) 68 Ricky Watkins, Brookline, Mo. 5. (7) 46 Brice Gotschall, Nevada, Mo. 6. (8) 21F Hannah Frazee, Pleasant Hill, Mo. 7. (6) 14T Quentin Taylor, Wheatland, Mo. 8. (4) 28A Justin Amick, Oscela, Mo. 9. (9) 21 Gregory Scheffler, Pittsburg, Mo. 10. (11) 29 Dalton Keith, Williston, N.D.
DNS – 5 John Briggs, Bull Shoals, Ark. 1. (1) 10T Tyler Brown, Richland, Mo. 2. (4) 19 Jimmy Cummins, Highland, Ill.
3. (5) 121 Tim Phillips, Fort Scott, Kan.
4. (2) 10P Dayton Pursley, Hermitage, Mo. 5. (10) 87 Justin Pike, El Dorado Springs, Mo. 6. (12) 57J John Fellers, Flemington, Mo. 7. (6) 64M Shawn Hendren, Nevada, Mo. 9. (8) 8 Robert King, Nevada, Mo. 10. (3) 30 Mark Long, Willard, Mo. 11. (11) 6 Trenton Butler, Raymore, Mo. DNS – 10W Jason Wescoat, Wichita, Kan.
2. (3) 22C Cole Campbell, Mexico, Mo. 3. (1) 32 Robbe Ewing, Stockton, Mo. 4. (6) 98K Kenton Allen, Chanute, Kan.
5. (15) 65 Kris Jackson, Lebanon, Mo. 6. (4) 00T Taylor Moore, Bois D'Arc, Mo. 7. (9) 8M Dillon McCowan, Urbana, Mo. 9. (12) 22 Brian McGowen, Pittsburg, Kan.
10. (14) 1F Mitchell Franklin, Camdenton, Mo. 11. (10) 1B Bobby Williams, Hermitage, Mo. 12. (18) 10T Tyler Brown, Richland, Mo. 13. (5) 18D Curt Drake, Moran, Kan.
14. (22) 121 Tim Phillips, Fort Scott, Kan.
15. (11) 2B Bowers Michael, Rogersville, Mo. 16. (24) 10P Dayton Pursley, Hermitage, Mo. 17. (21) 17 Rod Cordon, Independence, Mo. 18. (23) 68 Ricky Watkins, Brookline, Mo. 19. (20) 19 Jimmy Cummins, Highland, Ill.
20. (8) 28 Andy Bryant, Fort Scott, Kan.
21. (13) 18 Austin Joplin, Willard, Mo. 22. (16) 112 Justin Comer, Joplin, Mo. 23. (17) 5 Jeremy Lile, Higginsville, Mo. 24. (19) 30R Rex Harris, Macks Creek, Mo. 1. (1) 53R Ronnie Woods, Mexico, Mo. 2. (5) 8S Jon Sheets, Nevada, Mo. 3. (3) 9D8 Paden Phillips, Chanute, Kan.
4. (6) 227 Chase Domer, Nevada, Mo. 5. (7) 21 Ryan Middaugh, Fulton, Mo. 6. (9) 292 Kyle Thompson, Joplin, Mo. 7. (4) 85S Tyler Shaw, Mexico, Mo. 8. (2) 24D Donnie Fellers, Wheatland, Mo. 10. (10) 88 Jimmy Dowell, Booneville, Mo. 1. (1) 90 Terry Schultz, Sedalia, Mo. 2. (2) 38C Jason Pursley, Hermitage, Mo. 3. (4) 68 Dean Wille, Warrensburg, Mo. 4. (5) 75 Tad Davis, Mt. Hope, Kan.
5. (8) 22H Dustin Hodges, Centralia, Mo. 6. (7) 51G Lucas Gibbs, Udall, Kan.
7. (10) 18JR Chase Sigg, Iola, Kan.
8. (3) 4B Brayton Skaggs, Fort Scott, Kan.
9. (9) 112 Justin Moon, Sedalia, Mo. 10. (6) 11B Scotty Bough, Nevada, Mo. 2. (3) 87 Darron Fuqua, Mayatta, Kan.
3. (2) 1X Matt Johnson, Archie, Mo. 4. (4) 2 Tanner Mullens, Wichita, Kan.
5. (6) 73 Mickey Burrell, Fair Grove, Mo. 6. (7) 16S Chad Lyle, Oak Grove, Mo. 7. (5) 5 Robbie Reed, Mexico, Mo. 8. (8) 21W Tracy Wolf, Buffalo, Mo. 9. (9) 1B Bobby Williams, Hermitage, Mo. 1. (2) 16S Chad Lyle, Oak Grove, Mo. 2. (1) 51G Lucas Gibbs, Udall, Kan.
3. (4) 85S Tyler Shaw, Mexico, Mo. 4. (5) 5 Robbie Reed, Mexico, Mo. 5. (13) 11B Scotty Bough, Nevada, Mo. 6. (3) 18JR Chase Sigg, Iola, Kan.
7. (7) 4B Brayton Skaggs, Fort Scott, Kan.
9. (12) 88 Jimmy Dowell, Booneville, Mo. 11. (11) 112 Justin Moon, Sedalia, Mo. 12. (6) 24D Donnie Fellers, Wheatland, Mo. DNS – 1B Bobby Williams, Hermitage, Mo. 1. (1) 8S Jon Sheets, Nevada, Mo. 2. (5) 87 Darron Fuqua, Mayatta, Kan.
4. (13) 2 Tanner Mullens, Wichita, Kan.
5. (10) 227 Chase Domer, Nevada, Mo. 6. (6) 38C Jason Pursley, Hermitage, Mo. 7. (2) 53R Ronnie Woods, Mexico, Mo. 8. (11) 75 Tad Davis, Mt. Hope, Kan.
9. (7) 68 Dean Wille, Warrensburg, Mo. 10. (12) 22H Dustin Hodges, Centralia, Mo. 11. (9) 9D8 Paden Phillips, Chanute, Kan.
12. (14) 21 Ryan Middaugh, Fulton, Mo. 13. (20) 5 Robbie Reed, Mexico, Mo. 14. (17) 16S Chad Lyle, Oak Grove, Mo. 15. (15) 73 Mickey Burrell, Fair Grove, Mo. 16. (8) 1X Matt Johnson, Archie, Mo. 17. (24) 21W Tracy Wolf, Buffalo, Mo. 18. (19) 85S Tyler Shaw, Mexico, Mo. 19. (16) 292 Kyle Thompson, Joplin, Mo. 20. (18) 51G Lucas Gibbs, Udall, Kan.
21. (22) 18JR Chase Sigg, Iola, Kan.
22. (21) 11B Scotty Bough, Nevada, Mo. DNS – 4B Brayton Skaggs, Fort Scott, Kan.
DQ (4) 16 Austin Siebert, Grandview, Mo.